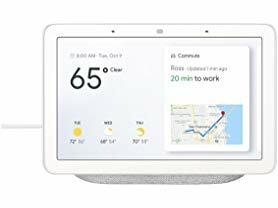 Today ONLY - Google Home Hub with Google Assistant $99.99 (Retail $149). Get a new digital helper with this interactive Google Home Hub device. Its 7-inch touch-screen display lets you view today's reminders, stream videos and watch your smart security camera's footage through Google Assistant. The built-in speakers and microphones of this Google Home Hub device have far-field voice recognition for convenient hands-free control. The ultimate digital photo frame. Use your voice to show any of your pictures in Google Photos, and with Live Albums, see the best and latest photos of loved ones. Voice-control thousands of compatible devices, from lights and cameras to TVs and more, all from a single dashboard. With Voice Match, get your calendar, commute, reminders, and more right on the home screen. You can even watch the news, make a shopping list, and place calls to friends, family, and local businesses.